The New LT-6 is a fully featured computer-controlled 6” Advanced Coma Free telescope that sets a new high-performance standard for telescopes selling under $1,200. Its legendary Meade optics, along with precision worm gear drives, sturdy die-cast aluminum mount and robust steel tripod make this the ultimate platform for high-resolution visual observation and imaging. Simply put, the LT-6 is the ideal telescope for any astronomer who demands superior optics, mechanics and computer control in a compact high performance package. The heart of any telescope is its optics. Meade Instruments offers you the finest 6” Schmidt-Cassegrain optics … period. Our advanced, proprietary processes deliver the highest quality professional grade optics available. For those who want more, we offer our patented Advanced Coma-Free (ACF) optical system, delivering distortion free, sharp-as-a-tack resolution from edge to edge. We invite comparison of our Advanced Coma-Free system to Ritchey-Chretien systems selling for thousands of dollars more. Meade’s ACF quality will astound you. After a quick and easy alignment, the AutoStar computer controller guides the telescope to any of the over 30,000 objects in its comprehensive library, automatically. Don’t know what to see? Simply choose the “Tonight’s Best” tour, and AutoStar will show you the evenings finest objects. Planets, galaxies, nebulae, star clusters, double and variable stars, asteroids, comets, earth satellites, the International Space Station and more, are all included in the 30,000 plus database. AutoStar is updateable with downloads from the Meade website. A rigid, die-cast aluminum mount solidly supports the optical tube in all sky orientations. 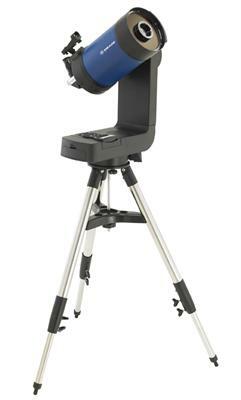 Precision 4.875” diameter worm gears in both axes provides smooth sidereal tracking of objects in the night sky. The stable, fully adjustable steel tripod delivers all the rigidity required in sensitive field applications. LT-6’s are smart scopes that know the night sky right out of the box. Just find level and North and then Easy Align picks two alignment stars for you and places them right in your viewfinder. Just center them to fine tune your alignment and the wonders of the universe are at your fingertips. The Meade LT-6 delivers an astounding level of optical, mechanical and computer performance in a telescope, all for under $1,000. No other 6” telescope delivers this level of performance or value. Click the button below to add the Meade LT 6" ACF Advanced Coma Free w/UHTC to your wish list.